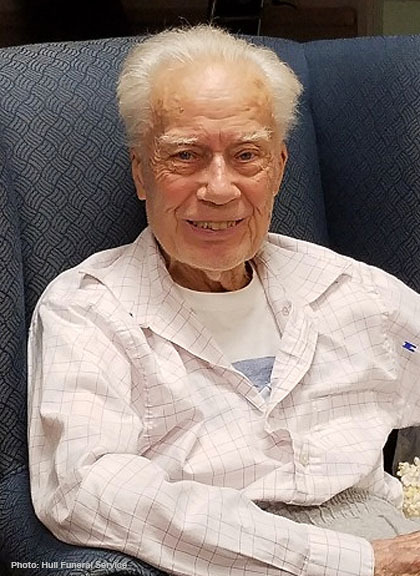 Jerrold Hubbard Davis (91), formerly of Danbury and Deland, Florida, passed away on Wednesday, May 23, 2018 at the Masonicare Health Center in Wallingford. Mr. Davis was born in Danbury on March 9, 1927 to Xe Sands Davis and George Harold Davis. He attended the one-room school house on Great Plain Road through fourth grade, and graduated from Danbury High School in 1943. He met his future wife, Leahdell Lehr, at the Newman’s Dance Studio in Danbury and the couple were married on September 23, 1950 at St. James Episcopal Church. Mr. Davis was hired as a sports reporter at the News-Times in 1943 and later became the sports editor. His beat included local and state sporting events, and a couple of World Series, hosted by the Yankees and Mets. He left the News-Times in 1969 to work at the Westport Town-Crier and later worked for the United States Postal Service, retiring in 1991. A veteran of the Korean conflict, he served in the U.S. Army in the Counter-Intelligence Corps from 1951-1953 and served on the committee for the Danbury Korean monument. An active member of a Masonic fraternity, Mr. Davis was a past master of Union Lodge No. 40. He also served terms as vestry member of St. James Episcopal Church, was a past President of the Danbury Old Timer’s Association, and served on the board of the Scott Fanton Museum. In 1988 he was appointed by Mayor Joseph Sauer as Danbury’s official City Historian, a position he held until 1995, when he retired to Deland, Florida. He returned to Connecticut in 2015 and lived his remaining years at Masonicare. Mr. Davis is preceded in death by his five older brothers, George Harold, Jr., Roderick, Robert, Ronald, and Hubert, and by his sisters, Barbara and Priscilla. He is survived by his beloved and devoted wife of 67 years, Leahdell, their children, Greg and his wife Deborah of Bel Air, Maryland; Nancy Davis of Keene, New Hampshire; Glenn and his wife, Dorothy of Lubbock, Texas; and Jill Adams and her husband, Steve, of Groton; and by six grandchildren and two great-grandsons. Mr. Davis will forever be remembered by his family and friends for his sense of humor, his outgoing nature, and especially for his love of his hometown, Danbury, a love he enthusiastically shared with all. Calling hours will be from 3:00-4:00 with a service at 4:00 p.m. on Saturday, June 2 at Hull Funeral Home, 60 Division Street in Danbury. Private Burial will be at Wooster Cemetery, Danbury. In lieu of flowers, donations may be made to the Masonic Charity Foundation of Masonicare in Wallingford, CT at www.masonicare.org.